Your CV will determine if you get your foot in the door for that next rung on the career ladder or a better position with more money and new challenges. It’s easy to forget your CV is a marketing document, sales proposal and an introduction / reflection of you. Your CV needs to show a prospective employer just how much you have to offer their company, to ensure you don’t miss out on that ‘perfect’ position. No wonder writing your own resume can be such a daunting task. 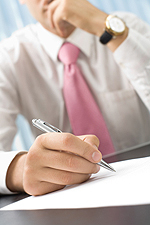 A professionally written CV can dramatically improve your chances of gaining an interview. Don’t struggle away, let Personnel Placements Ltd prepare your CV for you. A professionally written CV will dramatically improve your chances of gaining that all important job interview and cut the length of time you spend looking. Remember a CV is an investment in your future, spending money on your CV now may save you a lot of time, effort and unnecessary disappointment in the future. Our approach is to develop and tailor the process around your needs and timeframes, providing you with a CV that reflects your career and strengths, in a format that provides potential employers with the necessary information to help ensure you get that crucial interview.